This looks cool. I may come back and try it this weekend when i have more time. The Wordle is fun to play with, but unfortunately, it can eat up your time. I spent a couple of hours playing with it. Oh, dear. Kittens are bigger than books. uh, oh. You caught me. both are very nice. That kitten one is “mug worthy”. If you want colours: once the Wordle is created, find that little menu bar across the top that says: Edit – language – font – layout – color. Yes, I did see how to do the colors, but I couldn’t figure out how to save the design in a larger size. It kept saving in a form that was almost too little to read. I need to play with this some more! My-Heck-of-a-Guy is my husband Ken. Aka MyHOG. Fortunately, he’s a good sport. And Alaska is interesting…I lived there for ten years. 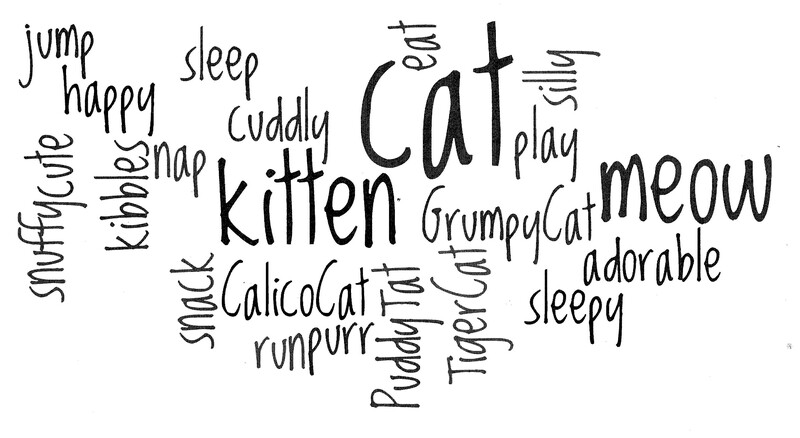 The kitties’ wordle are a favorite. I like the font you used–so kitty-like! I had fun with that one. The kitties just wanted to play longer to get more of their favorite words in, but I had to quit this major time eater. I really like this. Went and checked out the link. Thanks! Glad you like it. You’ll get hooked on it! Your welcome! I really enjoy your blog posts! Kitties on anything would be cute! Yes, I think this Wordle reflects the “About Me” very well. My favorite words stood out.